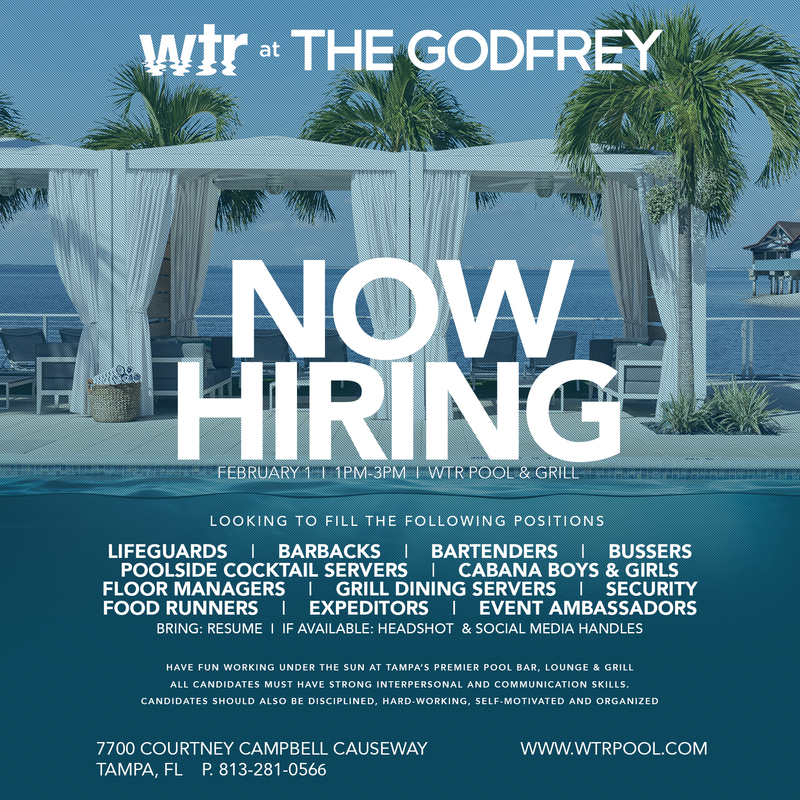 Tampa Bay, FLA (January 28, 2019) – WTR Pool & Grill at The Godfrey Hotel & Cabanas Tampa will be hosting two (2) job fairs on the property on February 1st and February 9th from 1:00pm – 3:00pm. The brand is seeking to fill 60+ part-time positions including lifeguards, barbacks, bartenders, bussers, poolside cocktail servers, cabanas boys and girls, floor managers, grill dining servers, security, food runners, expeditors, and event ambassadors. Applicants should bring a current resume, social media handles, and headshot, if applicable. All candidates must have strong interpersonal and communication skills and should also be disciplined, hard-working, self-motivated, and organized. Candidates are encouraged to RSVP prior to attending the job fair at https://www.facebook.com/events/369790763817324/. WTR POOL & GRILL: Offering Tampa Bay’s utmost majestic waterfront views, WTR Pool & Grill is a 20,000 square foot indoor & outdoor bayside/poolside multi-use venue; a new, contemporary and casual setting serving the freshest local seafood and classic American dishes. The restaurant, WTR Grill, serves breakfast, lunch, sunset dinners and late night bites.